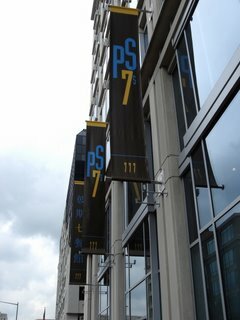 Penn Quarter's newest restaurant, PS 7's from chef Peter Smith, is expected to open its doors today. Metrocurean recently got a sneak peek of the space, designed by GrizForm Design (the next name to watch in the world of stylish restaurant interiors). So what's in store? An attractive and contemporary space dominated by cocoa brown and punctuated by a wavy sea blue wall that turns a corner and becomes the ceiling. (Did that just blow your mind?) A spacious bar and lounge area thoughtfully separated from the main dining areas. A bright yellow lava rock bar top that was shipped in pieces and reassembled like a giant jigsaw puzzle. And then there's the food. Smith, who spent 11 years in the kitchen at Vidalia, about half as executive chef, has divided his new menu (check it out here) into seven sections, with items in each section costing the same amount. There's warm foie gras custard, lamb loin with braised fennel puree, and octopus three ways (braised with red Thai curry glaze, as ceviche with uzu and red chile granite, and as a torchon with cilantro cucumber salad). In addition to mixing smaller dishes, diners will also have the option to order prix fixe tasting menus of four to seven courses. A separate bar menu is also available. Smith has recruited a talented team, including manager Danny Boylen, who recently won the RAMMY award for best manager for his work at Notti Bianche, and pastry chef Naomi Gallego, formerly of Vidalia and Equinox. Boylen has created a cocktail menu that pays homage to seven classics and offers up seven "creations" like the Dubstar, made with Jim Beam Black, black cherry lemongrass soda and house-candied cherries. There's also a nice sized patio overlooking the pedestrian walkway where Eighth Street is interrupted, but it may not see any action until next spring. I went on Monday for mock service. it was really fantastic. Great to hear. Tell us more! Isn't the space cool? I love the space! Totally spot on for the area and the food. I'll publish my post later today. I feel like I have a big secret. Had a great time at dinner. Our food was excellent and our waitress, Holly was amazing and absolutely beautiful. Everyone should ask for her section. 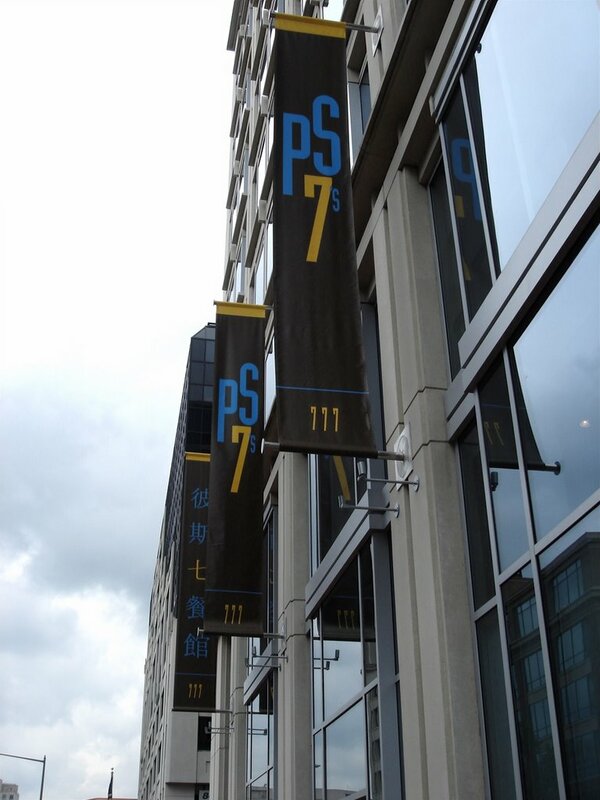 I discovered this place quite by accident when I was walking through the Penn Quarter / Chinatown Neighborhood in DC. I did not realize a restaurant had opened there. The food at PS 7's is delicious - five star service and food by any measure. Highly recommended.